Timo Soini’s party is called in the article “True Finns” in order not to confuse our foreign readers, as the term Finns’ Party that is the official English name of the party does not correspond to the Finnish denomination (Perussuomalaiset, which means Basic Finns), and is too vague, as any other party could also be seen as a Finns’ party for a foreign reader. He indicates that he has spoken about bailouts for the last five years, and that he has said what he had to say on the matter beforehand. He considers that Finland is now paying for mistakes from the past, as the options that Finland had four years ago no longer exist. He explains that “Back then I knew we were headed towards bailouts. I didn’t want to go in this direction because I thought it was the wrong way to handle the issue. We entered the opposition. During those four years the government thrust itself headlong into bailouts and financed them. We resisted. We lost. Today those bailouts still exist, so does the money granted for them, given by others. This capital given by others will be used if a deal is struck.The Finns Party supporters want us to make a difference. We can do so from opposition but the main power is with the government, whether it is right or wrong“. He added some paragraphs justifying the new bailout by his will to keep the government and Finland functioning: “The current government has existed for six weeks. I wonder what would happen to the trust the voters have placed on us if we turned out to be a party that could only last six weeks. The country would go into a new election. We cannot leave Finland stranded on its own. The bailout would go on regardless. Talvivaara, Fennovoima, Microsoft… They’d expect to see a new government by late autumn. We’d get a new muddled, confused government and four years down the drain. I don’t want that“. He explains that Finland was alone wanting, in line with the True Finns, that Greece is pushed out of the euro, which is not that his partners in coalition Sipilä and Stubb have explained: “Today we heard about the government’s plan of action with regards to Greece. The Finns Party believed that Greece should leave the euro, but our motion was denied. This was the motion put forward by the entire government and the Finns Party but unfortunately it did not pass. We strived for something and in return received something else entirely“. And then he gives an argument which has already been given by his opponents in Finland: we accept the bailout because Finland may lose billions of euros: “If Greece folds it means billions of euros are lost in the process. If we support Greece, the price is high, too. Unfortunately no other options remain at this stage. Our hope is that people will understand this“. He also insists on the fact that Finland could oppose the decision, but that it would have no impact as the decision could be adopted without Finland’s vote. In fact, it is not true, as an opposition of Finland to the 90 billion euros additional loan would have made it totally impossible, as unanimity was required. It is for the bridging loan of 7 billion euros in order to help Greece survive in July that a 85% majority only was required, and this small bridging loan could be adopted without Finland. He wrote: “I have taken a scolding on this, mainly by those who were in charge of creating this shaky bailout for Greece. We have now entered negotiations that Finland had no way of stopping. If the Finns Party would have left the government, it wouldn’t have made any difference. I have received feedback from our supporters and the message is clear. 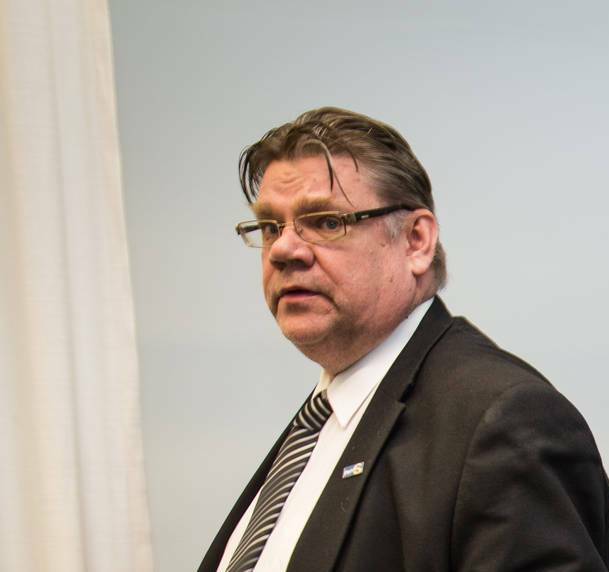 The fate of the Finns Party cannot be in the hands of communist Greeks. I am sure this will be understood“. After the publication in the newspapers of the loss of confidence in the government and in the Finns’ Party in the days following the agreement with the new Greek bailout, he minimises the topic: ” Today we received our current support numbers by Helsingin Sanomat: 17.6 percent which is pretty much the same as during the election. These numbers are monitored and published every month by YLE and interpreted by the same blind individuals who even on election night commented on the early vote like it was the end result. ‘The Finns Party will collapse!’ This is what they said then and this is what they say now“. He then addresses his supporters in the party, boasting of his successes with the government programme: ” At the moment we are the second biggest party in Finland and this is a power that we must utilise. Not everything will go according to our plans, but then again a whole lot will. The taxation of cars was lowered by 200 million and the aid to developing countries cut by 300 million. The VAT will not rise, the taxation of petrol will not rise and pensions will go up… One must believe in oneself instead of whimpering and complaining“. It is in fact a very small part of the True Finns’ programme, and in addition the pensions will increase very little and the other supports for pensioners will go down three times more, which will cut the resources of the poorest pensioners. This sentence makes me doubt that Timo Soini has analysed in detail the government’s programme he has signed, and that his supporters will accept certain parts of the government’s programme. . These elements are attempts to regain some ground after the negative impact of the decision of Sipilä-Soini-Stubb government’s decision on Greece, some weeks before he will run for his re-election as the chairman of the True Finns. ‹ A bad month of July for Alexander Stubb, Finland’s Minister of Finance, and better years to come?